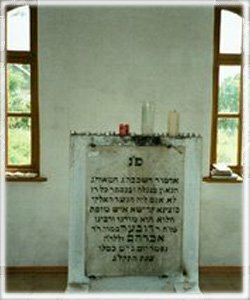 The most famous and respected student of the Baal Shem Tov was Rabbi Dov Ber of Mezherich, known as the Maggid ("preacher") of Mezherich. A great Torah scholar, Rabbi Dov Ber, before he became a follower of the Besht, had led a secluded life, with little care for material concerns. When he fell gravely ill, he sought advice and help from the Besht, famous for working miracles. The Besht told him that though unable to cure him completely, he could halt the advance of his debilitating leg disease. Thus Rabbi Dov Ber of Mezherich became a prominent disciple of the Besht and a herald of the Chassidic movement. The Besht's son, Reb Tzvi, felt incapable of assuming the leadership of the Chassidic movement, so, following the instructions of his father, who appeared to him in a dream, he willingly yielded this role to Rabbi Dov Ber, who had won the respect and love of the Jewish masses. People flocked to the Maggid for counsel and blessings. Many were attracted by the new leader's charismatic personality. Rich and poor, Torah scholars and simple folk alike, they came in swelling numbers. Unlike his teacher, the Besht, Rabbi Dov Ber could not travel due to poor health. In order to perfect their knowledge and perform good deeds, thousands of Chassidim came to the new Rebbe; Mezherich became the center of Chassidism, the heart of inspired devotion to the Almighty. The Chassidim preferred to settle next to their Rebbe, and in this fashion the center of the Chassidic movement shifted from Podolia to Yolyn. At that time - the mid-eighteenth century - Vilna was the major center of Jewish learning, called by the Jews "the Jerusalem of Lithuania." The Gaon of Vilna, Elijah ben Shlomo, enjoyed absolute authority there. He was famous worldwide not only for his phenomenal knowledge, but also for his profound piety. It so happened that Vilna became the stronghold of the opponents of the Chassidic movement, with the Gaon's disciples at their head. At first, the rabbis of Lithuania were content with dissociating themselves from the new "sect," in the hope that Chassidism would not with­stand the test of time. However, the passing of the Besht was followed by a surprising development: the popularity of the new movement not only did not wane, but, on the con­trary, continued to grow, evolving into a truly popular phe­nomenon. The Maggid of Mezherich trained an entire galaxy of brilliant disciples, many of whom became Rebbes, founding various dynasties within Chassidism. Among the most noteworthy disciples, followers, and successors of the Mag­gid are Rabbi Shmelke of Nikolsburg, Rabbi Ya'akov Yitz­chak of Lublin, Rabbi Elimelech of Lizhensk, Rabbi Men­achem Mendel of Vitebsk, Rabbi Levi Yitzchak of Berdi­chev, Rabbi Aharon of Karlin, Rabbi Shlomo of Karlin, and the Maggid of Koznitz. Rabbi Shneur Zalman of Liady, the founder of Chabad Chassidism and author of the Tanya was a particularly prominent Rebbe. The followers' admiration for the Maggid knew no bounds. Thus, for example, the "hidden tzaddik," Reb Leib Sarah's, would say that the reason he went to the Maggid was not so much to learn Torah, but simply to be in his presence and watch him performing the commandments. The Maggid of Koznitz recounted that before he came to Mezherich for the first time, he had already studied eight hundred books on Kabbalah. Once in Mezherich, however, he realized that he had not even begun to understand Kab­balah. In 1772, Rabbi Dov Ber departed from this world. Shortly before that, the heads of the Vilna and Brody com­munities came out with a categorical condemnation of the Chassidic movement. They issued bans against all followers of Chassidism, declaring that the members of the new movement did not believe in G*d, and placing strict prohibi­tions against eating bread or drinking wine made by them, and certainly against intermarriage with descendants of Chassidic families. Similar proclamations were issued on several other occasions in 1781, 1784, and 1796. However, even these measures did not seem suffi­ciently radical to the opponents of Chassidism (called mitnagdim). As early as 1772, a month after the publication of the first ban, a letter was posted from Vilna to all Jewish communities of Eastern Europe. According to that letter, the Chassidim distorted the traditional sacred prayers, and thereby severed themselves from Judaism. "These nonbe­lievers," the letter continued, "insert alien words in the prayers, words that are bizarre and false; moreover, they shout these words in such a loud voice that the walls shake. They make strange body movements, and their entire man­ner is abnormal. And they call all this the flight of the spirit! For these people, every day is a holiday! They neglect To­rah studies, ignore learning and erudition, and deny the im­portance of repentance. Inthe light of the above," concluded the letter, "we call upon all our brethren, the sons of Israel, wherever they are, be it far or near, to act as befits the keep­ers of the faith, and to repudiate these heretics. Anyone who fears G*d should distance himself them from!" Amazingly, the greater the persecutions against the new movement, the more it grew and expanded. All the ter­rible threats, strict prohibitions, and bans proved powerless against the overwhelming, all-embracing vitality of the Chassidic movement. Chassidism spread like wildfire. Smaller groups of Chassidim merged into larger ones, and regional centers emerged, each headed by the local Rebbe. With time, certain distinctions began to arise between the groups that followed different Rebbes. Some emphasized the importance of reason and understanding (an approach adopted primarily by the Chabad dynasty); others focused on the miraculous powers of the Rebbe (the Belz Chassidim, for example); still others stressed the importance of inspira­tion during prayer, or the powerful effects of joy and singing. As a rule, the Rebbe's title and status were inherited. However, there were many cases in which the Rebbe was succeeded by a prominent and devoted disciple. Sometimes it was the son-in-law of the previous Rebbe, or a more dis­tant relative; occasionally, the successor was a member of the older generation of Chassidim. Usually it was the Rebbe himself who appointed his successor.